Without a doubt, one of the most reviled and revered mobile devices of this past year has been the Galaxy S line, from Samsung. It seems that, beyond Motorola’s DROID line, the Galaxy S was the phone that really took Android mainstream. So how does Samsung top itself? The Galaxy S II, of course. 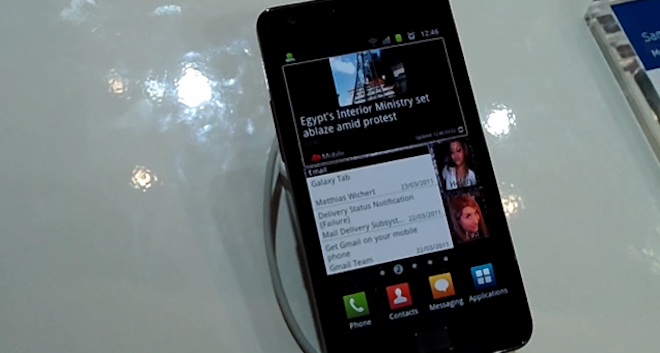 The II runs Android 2.3.3 (at the moment) on a 4.27-inch 480×800 Super AMOLED Plus display. While Super AMOLED can look amazing, I wasn’t really impressed with the original ones in the Galaxy S line. The new Plus model is astounding. It’s crisp, clear and has a touch response that seems to me to be considerably more precise than what we had on the original Galaxy S phones. The phone’s supremely thin. And I’m not exaggerating when I say that it is notably thinner than any phone you’ve held thus far. Picking it up, even with the security tether, it was an absolute joy to hold. The rounded corners are a nice touch, but the scalloped back was beautifully done. While I didn’t get a chance to spend much time with the II, what I did see was really impressive. The new TouchWiz improvements are enough to keep me from even wanting to root the phone and apply any other mod to it. At least at this point. While the Galaxy S II isn’t exactly breaking news (we actually got some great details on it back at MWC), it’s still plenty new enough that you’ll want to know more about it. Keep up with TNW Mobile for full details as Samsung continues to release more incredible handsets in the future.